It's been a while since I posted about soloing world bosses. The last post was about soloing Doomwalker in Shadowmoon Valley. Now it's time for the second and for now, the last world boss in World of Warcraft. Perhaps I will be writing about soloing MOP world bosses after the Legion expansion that may come after Mists of Pandaria. Feeling bold? Try to tackle him! Guaranteed loot: 2-3 BOE epics and lots of gold! World bosses are fun to solo. Not only are they more difficult than your average boss in a dungeon, but they also offer guaranteed BOE epics and a pile of wow gold. He spawns in Hellfire Peninsula and has up to 5 days respawn time. The most difficult part of this gold making tip is to actually see Doom Lord Kazzak spawn. Otherwise it's as easy to kill as Lootwalker is so there's lots of competition usually. Kazzak also likes to yell when he has spawned so every player in Hellfire Peninsula will notice him, making it even more difficult for you to get his epics. There's just one goal in the fight: Do more damage than he does healing! As long as your DPS is good enough, you will get 50 gold and 2 BOE epics usually. Some of these offer good looks and will sell better than the others. Otherwise they are good for any level 70 player who wants to level PVE epics equipped. As for the value of the loot, I usually sell them for between 300 gold and 7000 gold a piece. Spawn time ranges from 2 days to 5 days. Only a level 85 player should attempt to solo Doom Lord Kazzak. As for gear, even greenies are enough to get the job done. I've personally soloed this boss only with leather and plate users, so not sure about how well say, a mage does. 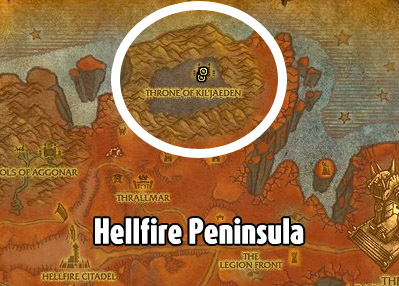 Protip: Park an alt in Hellfire Peninsula and check if he has spawned from time to time! I think you meant to say Outland world bosses, not World of Warcraft world bosses, as there were several added for Cataclysm (not yet soloable though). I don't consider them world bosses. Rare elites is more like it. 1) They're just your average rare monsters. 2) No drop tables. Just one specific drop. 3) No gold drops afaik. 4) Not a raid boss. A good group of 5 players is enough.